The Orville H. Schell, Jr. Center for International Human Rights supports tomorrow’s leaders in human rights through broad and evolving academic programming, clinical work, and fellowships. When Colleen Gilg ’08 was in her second year at Yale Law School, she spent six weeks investigating Charles “Chuckie” Taylor, Jr. while working at the Center for Justice and Accountability (CJA) as a Kirby Simon Summer Human Rights Fellow. Chuckie Taylor was the son of Charles Taylor, Sr., the president of Liberia from 1997 to 2003 and a dictator accused of brutal war crimes. Born in the United States, Chuckie Taylor was seventeen when he moved to Liberia in 1994 and led a select military group called the Anti-Terrorist Unit (ATU), designed to protect the government from insurgents. The ATU carried out barbarous acts of violence during a period of regional civil war in which an estimated 600,000 Liberians were murdered or subjected to torture. In March 2006, the United States arrested and charged Taylor for his role in the 2002 torture of a student activist in Liberia. Prominent human rights organizations called upon the Department of Justice to prosecute Taylor for torture and war crimes. It was during this time in 2006 that Gilg was digging into the case. Through her fellowship from the Orville H. Schell, Jr. Center for International Human Rights at Yale Law School, Gilg worked to collect information on Taylor and helped draft a complaint that CJA, a human rights organization based in San Francisco, was preparing to file in U.S. federal court if the government chose not to prosecute Taylor for war crimes. Taylor was subsequently charged with five counts of torture, in addition to conspiracy and firearms-related charges, convicted, and sentenced to ninety-seven years in prison. Gilg’s experience highlights one of many avenues available to students at Yale Law School to pursue international human rights work. According to Professor James Silk ’89, who teaches the Lowenstein International Human Rights Clinic, because of the myriad ways students can engage with human rights work, there is no “typical path” that they take. “We encourage students who are passionate about human rights to create their own paths, exploring the wide range of opportunities that the Law School offers, from the Lowenstein Clinic to the rich discussions in the Human Rights Workshop to summer fellowship experiences that are usually true intellectual adventures and profoundly transform students’ perspectives,” he said. For many students, getting involved with human rights work at the Law School begins with the Lowenstein Project, the student human rights organization founded in the early 1980s. That experience often leads them to the Allard K. Lowenstein International Human Rights Clinic in the second semester of their first year. The Lowenstein Clinic provides students with firsthand experience in human rights advocacy and a critical exploration of human rights theory and practice. Students in the clinic get practical experience with the varieties of work lawyers do to advance human rights, and, collaborating with partner organizations and clients, contribute to efforts to protect human rights globally, including in the United States and in Connecticut. Recent examples of the clinic’s work reflect its geographic, substantive, and methodological range, as well as its ability to foster partnerships and networks with diverse human rights groups. 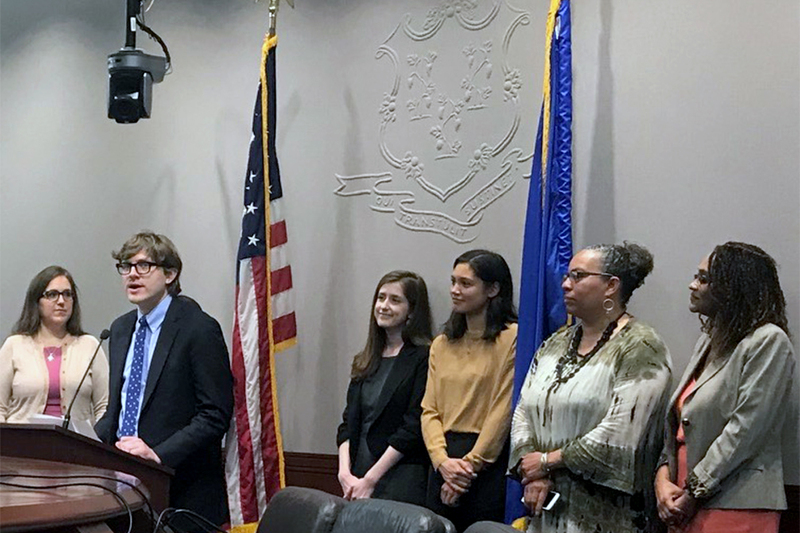 In November 2016, the clinic released the report, “Forced into Breaking the Law: The Criminalization of Homelessness in Connecticut,” which exposes how Connecticut’s homeless residents face a habitual cycle of criminal sanctions for behavior necessary for simply existing. With the Justice Project Pakistan, a Pakistani human rights organization, the clinic produced a report, published in September, titled, “A Most Serious Crime: Pakistan’s Unlawful Use of the Death Penalty.” It documents the various ways in which Pakistan has violated international law in its imposition of the death penalty. During the fall 2016 semester, the Lowenstein Clinic authored an amicus brief in a case against the Norwegian government over its decision to issue licenses authorizing new oil drilling in the Arctic. The suit filed by Greenpeace Nordic and Nature and Youth, a Norwegian non-governmental organization, argues that the government’s decision to issue these new licenses violates the Paris Agreement and the Norwegian Constitution’s protection of the right to a healthy environment. The Clinic’s brief focuses on the obligations Norway must fulfill under international human rights law, including the rights to life and health and the rights of the child, with a focus on sustainable development and intergenerational equity. When the academic year ends, many students pursue human rights work over the summer through the Kirby Simon Summer Human Rights Fellowship, often finding that the experience catalyzes their consideration of the careers they want to pursue. That was the case for Colleen Gilg. After graduation, Gilg’s career path took several turns before returning to human rights, a trajectory familiar to many young attorneys who want to practice human rights law. Gilg spent two years at Simpson Thacher & Bartlett LLP in New York, where she helped represent the government of the Dominican Republic in an international arbitration proceeding and successfully represented several clients seeking asylum. She also worked as an associate legal officer in the Office of the Co-Prosecutors at the Extraordinary Chambers in the Courts of Cambodia, the special court established to try leaders of the Khmer Rouge for atrocities during its brief reign, and then clerked at the U.S. District Court for the Western District of Washington. After her clerkship, with the support of a Robina Foundation Fellowship in International Human Rights, Gilg secured a six-month role as a Visiting Professional in the Office of the Prosecutor of the International Criminal Court (ICC) in The Hague. Gilg was eventually offered several different full-time positions from other international criminal tribunals in The Hague. She worked for a year in the office of the prosecutor at the Special Tribunal for Lebanon and then moved to the ICC, where she is an associate trial lawyer. Gilg’s most recent case, which went to trial in December, was The Prosecutor v. Dominic Ongwen—in which Ongwen, the ex-commander of a guerrilla group that formerly operated in northern Uganda, was charged with seventy counts of crimes against humanity and war crimes allegedly committed, beginning in 2002, in northern Uganda. 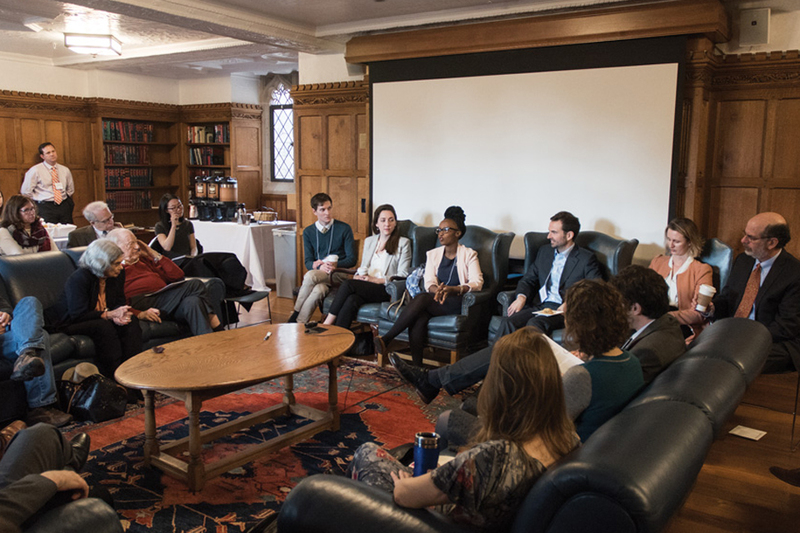 To train future leaders in human rights and create holistic, sustainable advances in the field, the Schell Center coordinates a diverse program of activities that serve students and scholars at Yale and contribute to the development of the human rights community locally and internationally. Founded in 1989, the Schell Center is named in honor of Orville H. Schell, Jr., a distinguished New York City lawyer and partner at Hughes, Hubbard & Reed, who was vice chairman of Helsinki Watch and chairman of Americas Watch from its founding in 1981 until his death in 1987. The Schell Center is led by Paul W. Kahn ’80, Robert W. Winner Professor of Law and the Humanities, and James Silk ’89, recently named the inaugural Binger Clinical Professor of Human Rights. 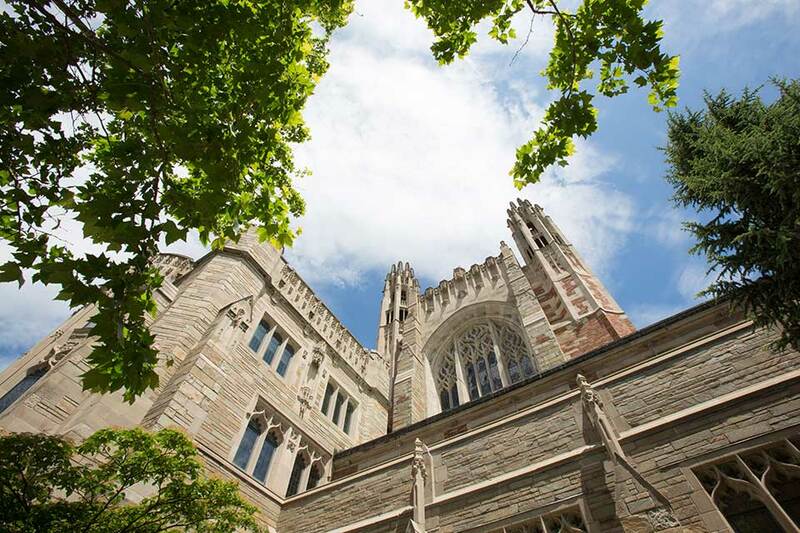 This new faculty chair was made possible by a landmark $13 million gift from the Robina Foundation, which will also create a Robina Human Rights Initiative Endowment, building on the Foundation’s longstanding, visionary support of human rights programs at Yale Law School. This initiative began in 2008, when the Robina Human Rights Fellowship Initiative was created. Working in concert with the Schell Center to provide long-term and far-reaching support for scholars and practitioners of human rights, the Initiative has supported Law School students and graduates interested in human rights through summer internships, post-graduate fellowships with human rights courts and other institutions, and financial aid. The funds have also brought leading scholars and practitioners of human rights to the Law School to conduct research, write, teach courses, give talks, host discussions, advise students, and participate in conferences. Like Colleen Gilg, Tendayi Achiume ’08 used two Kirby Simon Summer Fellowships to explore her career options in human rights work. With her first summer fellowship, Achiume worked with Human Rights Watch, and with her second, La Rencontre Africaine pour la Defense des Droits de l’Homme, a non-governmental organization founded in Senegal—and now with offices across West Africa and in France—that works on promoting, protecting, and monitoring human rights, as well as on preventing, mediating, and resolving conflicts. After her summer fellowship at Human Rights Watch, Achiume reported that the experience allowed her to reflect on what kind of law she wanted to focus on. “I had begun to develop a sense for the sorts of issues that interest me and the area of law I would want to commit to after graduation,” Achiume wrote. “Within the area of human rights law, I had become increasingly fascinated with international justice.” Her fellowship at Human Rights Watch made real to her what work in this area of international law entailed. After graduating from the Law School, Achiume clerked on the Constitutional Court of South Africa and was then awarded a Robert L. Bernstein Fellowship in International Human Rights from the Law School to work for a year at Lawyers for Human Rights (LHR) in Johannesburg. Achiume worked at LHR’s Refugee and Migrant Rights Project unit, which provides legal services to asylum seekers and refugees, and, in addition to advocacy work, regularly publishes reports on the legal position of refugees, asylum seekers, and undocumented migrants in South Africa. As a student in the Lowenstein Clinic, she had worked on a refugee rights project focusing on South Africa and, on the basis of that experience, developed a strong interest in involuntary displacement and the human rights issues it raised. The Bernstein Fellowship, established in 1997, is named in honor of Robert L. Bernstein, a leader in the development of the international human rights movement, most famously as the founder and longtime chair of Human Rights Watch. Started by Bernstein’s wife, Helen, and their three sons, Peter, Tom ’77, and William, the fellowship program is supported by Bernstein’s family, friends, and colleagues. Achiume is now an assistant professor of law at UCLA School of Law, where her research has focused primarily on international human rights law, refugees, and involuntary migration. “My Bernstein Fellowship played a crucial role in setting me on the path I feel fortunate to be able to pursue today. It gave me experience working with the people the global frameworks I study are intended to benefit. It also made vivid the many dangers and opportunities these frameworks carry with them, including international human rights law. It made all the difference.” Strongly influenced by Professor Silk’s mentorship, she now also teaches an international human rights law clinic at UCLA. In addition to offering the Lowenstein Clinic and fellowship opportunities, the Schell Center hosts the annual Robert L. Bernstein International Human Rights Symposium, which brings to the Law School, in addition to prominent scholars and lawyers working in human rights, current and former Robina Fellows and Robert Bernstein International Human Rights Fellows, who share their experiences. The Center also supports the Yale Human Rights and Development Law Journal and student projects related to human rights, including the Lowenstein Human Rights Project. 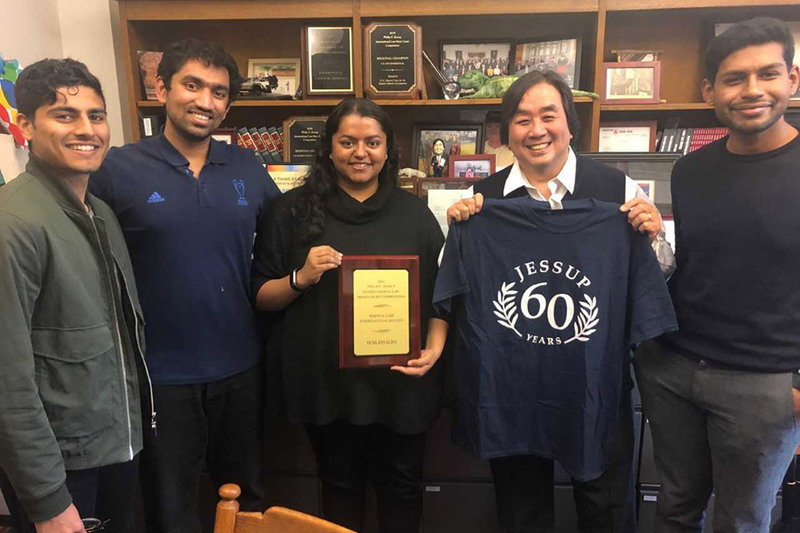 And as part of its efforts to foster the study and practice of human rights and build a community of human rights advocates and scholars across the University, it started and operates the undergraduate Multidisciplinary Academic Program on Human Rights in Yale College. Through these opportunities, students have diverse opportunities to engage with leading human rights scholars and activists, research and analyze current and potential human rights abuses, and critically assess the tools available for protecting human rights. During their time at Yale Law School —and, now, in Yale College—they learn to think of effective ways to stop or prevent these abuses, through activism, scholarship, policymaking, or litigation. The range of human rights issues and work is broad and always evolving, and the efforts of the Schell Center, with the support of the Robina Foundation and the Bernstein family, help to grow and sustain a network of human rights scholars and practitioners. “The vision for the Schell Center, including the Robina Human Rights Initiative, the Lowenstein Clinic and the Bernstein Fellowships, is to provide our students, through a series of investments in them, with the learning and practical experience they’ll need to become human rights advocates, scholars, and leaders—and to do the long, hard work of repairing the world, of securing a little more justice, a little more equality, a little more respect for human rights,” said James Silk. [Top photo] The annual Robert L. Bernstein International Human Rights Symposium brings together prominent scholars and lawyers working in human rights, as well as current and former Robina Fellows and Robert Bernstein International Human Rights Fellows. The 2016 Symposium focused on arts and international human rights. [Second photo] Colleen Gilg ’08, associate trial lawyer at the International Criminal Court in The Hague, credits her experiences supported by the Schell Center with helping her pursue her calling. [Third photo] Tendayi Achiume ’08 is an assistant professor of law at UCLA School of Law and specializes in international human rights law, refugees, and involuntary migration.